A more familiar sound than sight throughout North America, bullfrogs (Lithobates catesbeianus) can thrive in captivity. As amphibians, they aren’t necessarily the easiest pets to own. Bullfrogs need specific conditions, can’t be handled and most certainly should not be released if you get bored with them unless they originated in your area in the first place. For these reasons, they are not suitable pets for children. Adults fascinated with amphibians might find them interesting pets, but they require commitment. Set up a large tank for the frogs, the bigger the better. Mature female bullfrogs can reach 8 inches long, and the males aren’t much smaller. At a bare minimum, you need at least 20 gallons for one frog and 5 extra gallons for each additional one. Get the biggest tank you can afford. The basic items you need for the tank are a powerful filter, gravel, rocks to make a land area, a light and some aquatic plants. This species doesn’t need a heater if you keep the tank in a warmish room. Stick colored paper or aquarium backdrops to three sides of the tank. 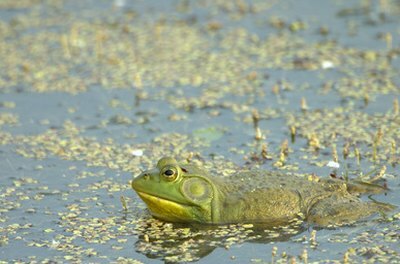 Bullfrogs have a tendency to jump against glass, hurting themselves, the Chicago Exotics website says. If your frogs still jump against the exposed glass, try hanging a semi-transparent screen, such as muslin, over it when you aren’t observing them. Feed the frogs live invertebrates such as earthworms, mealworms and crickets. Bear in mind that bullfrogs are voracious predators and will eat too much given the chance. Feed adults no more than two or three times a week and juveniles every couple of days. Overweight frogs can develop serious health problems. Dust the food with a calcium supplement for amphibians once a week according to product instructions. Remove leftover food and visible feces every day. A set of aquarium forceps comes in handy for this task. Clean the tank at least once a week using a gravel cleaner and bucket. Remove waste along with a third or so of the water, replacing with fresh, dechlorinated water. Note that frogs are at least as sensitive to toxins in the water as fish are. To remove chlorine and chloramine from tap water, use a commercial dechlorinator. You can remove chlorine simply by leaving the water in buckets for 24 hours but this won’t remove the equally dangerous chloramine if it's used in your area. ⚠ Do not handle bullfrogs unless absolutely essential, doing so using wet hands or, preferably, a plastic container. The oils from human skin are dangerous to amphibians; in turn, amphibians carry salmonella, which is harmless to them but could make you very ill. Don’t allow small children unsupervised access to the tank. ⚠ Always wash your hands and rinse very thoroughly before feeding the frogs or cleaning the tank. Afterwards, wash your hands with antibacterial soap. ⚠ The ideal habitat for a bullfrog is a pond, but such a setup is an option only for those who live where bullfrogs are a native species, not an introduced one, so yours won't multiply into an invasive species. Acquire tadpoles or frogspawn from a local pond, not online or through a supplier, since populations vary genetically. Similarly never release bullfrogs into the wild unless they are native to your area and came from a local habitat in the first place. If you find yourself unable to care for your pets, contact a local animal charity or reptile and amphibian club to re-home them.